It’s great to see democracy in action. A few weeks ago I posted an item commenting on the sudden cleanliness of the canals in the Wolverhampton area, following the introduction of Community Payback – a canal clean up project forming part of the local offender rehabilitation programme. I was therefore interested to see an item in the Wolverhampton Express and Star explaining that this initiative emerged following a public vote by the good people of Wolverhampton on what community service offenders should undertake. Clearly, the local inhabitants love their network of canals and voted for the water based initiative we saw in action. The offenders have patently swept the Wolverhampton area clean and have now moved onto the Bradley Arm which, if it is still anything like it was during our misguided attempt at navigation in 2007, will offer enough material to keep them busy for the rest of 2009. Top tip – try raking the canal bed for polythene bags as well as clearing the margins and bridgeholes of the more obvious debris. The canal bed is littered with thousands of non biodegradable bags, which represent the main obstacle to navigation. As Government Crime and Justice Adviser Louise Casey said: “The people in Wolverhampton want to know that criminals in Wolverhampton are being made to pay back for their crimes. It’s great to see people power in action. I love old photos of the BCN and was fascinated by a series published in the July edition of Canal Boat. The photos were taken by an obscure character called H R Hodgkinson and the item was pulled together by Hugh McKnight. 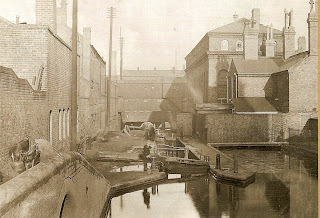 The photo which really caught my eye was 1913 image looking down the Farmers Bridge Locks. The narrative didn't specify which specific lock it was but I took one look and thought "I know where that is - it's lock number 13 at the bottom of the flight. The configuration of buildings surrounding it is unique"
I found myself in the centre of Birmingham the next Saturday with half and hour to spare, so I took my camera and the copy of the Canal Boat article, and set off to try and recreate the image. I arrived above lock thirteen and was stopped in my tracks. Yes, the configuration of buildings was about right but the view was partially obscured by a huge railway viaduct - which may post date the canal, but was most certainly present in 1913! What was more, the buildings surrounding the lock were not quite right and no amount of tinkering could have transformed what I saw in the black and white image into what lay before me. With the wind rifling through the pages of the the magazine I took a closer look. There was a small brick bridge over a side entrance just before the lock and then, after the lock, another towpath bridge with thin cast iron railings giving access to yet another arm or wharf. I retraced my steps looking for evidence of these telltale structures and much to my surprise, found them. The brick bridge is located between locks eight and nine - once providing access to a substantial warehouse which now stands alone in a redevelopment bombsite, it's bricked up boat access arch plainly visible once more. The cast iron bridge also remains just before lock ten. But of the surrounding area absolutely nothing remains. The once thriving Elkington and Co's electro plating works is long gone and now replaced with swanky new apartments . I couldn't event get an exact duplication of the photo due to the construction of a modernistic footbridge over the canal, one end of which is is keyed into the span of the brick accommodation bridge. The old may have passed away but the preservation of the canal warehouse is encouraging. I guess that it is too much top hope that the 100 yard strip of canal could be reinstated, taking water right back into the building? Imagine riding along the towpath of Regents Canal and suddenly being confronted by a yawning chasm, complete with a waterfall in the middle of the towpath. It’s enough to make you lose your balance. This was the scene facing London’s cyclists courtesy of a piece of BW commissioned pavement art by Joe Hill and Max Lowry, who have been plying their trade on the streets of our capital for the last five years. I love this photo of a cyclist nervously peering “down” into the abyss. It is part of a serious campaign to get cyclists to take more care as then travel along the towpaths, some of whom seem oblivious to the safety of other users. Is this a good use of resources? 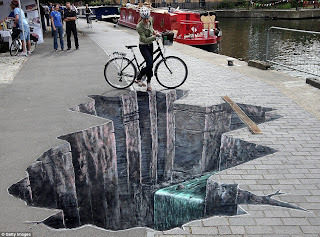 Well, like the 3d effect of the street art, it depends how you look at it. Viewed from above it makes no sense taken from the right perspective the results come dramatically into focus. It’s a bit like BW’s funding problems – viewed straight on, the expense of the system is high for a limited number of boaters, but step into the millions of towpath users shoes and the cost benefit equation is radically transformed. I owe a debt of gratitude to Jim Davies of nb Starcross. 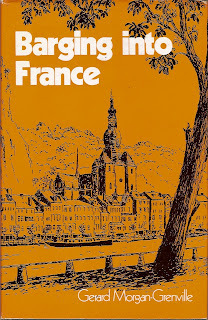 His original review of Barging into France prompted me into buying a copy of its sequel, Barging into Southern France. If that wasn't enough, he then kindly agreed to do a swap with me and the above book was waiting for me when I got home from work last Wednesday evening. Two days later and I had finished it, spellbound by a the tale of an epic European boat trip undertaken nearly forty years ago. Whilst I rated the second book "very good" this introductory publication was even better - A* in fact. All my questions about the nature of the boat and how he came to be in the middle of France were answered in a beautifully crafted narrative. He made it plain that the tale was about the boat, Virginia Anne and the places she visited, not about the character of her crew. His account of the first weeks travels in sub zero temperatures and against rivers in flood was gripping, and he displayed a remarkably sanguine approach to boating life in the face of a need for a new engine, a new propeller and the installation of a new stern gland all in his first six months of ownership! Equally shocking was the fuel consumption of his 150 ton craft. In it's original state it operated a pre war American petrol engine, which produced a rated power output of little over twice Wand'ring Bark's 38hp. However, its fuel consumption rate was slightly less then one mile per gallon! It's a good job this journey was undertaken before the escalation of oil prices in 1973. His writing style is slightly dated, somewhere between Pathe News and contemporary but wonderfully evocative. He selects his words with care, applying then to his tale like colours from an artists palette, building up layer upon layer till you find yourself immersed in the sights and sounds which surrounded him. "...One morning we had weighed anchor at about half past six. It was one of those days when all the world knows it is going to be as hot as hot can be. The dew was exceptionally heavy and the mist so thick that we had to wait some time for it to clear sufficiently before we could proceed. The water was absolutely still except for the occasional splash of a water rat or moor hen. Rounding a bend, I saw an unforgettable scene from a Chinese print: two fishermen at either end of a punt, silhouetted against a silver mirror of water and a background of mist, completely motionless. On either side the still reeds, their cuneiform leaves rising ladder-like from the water. A little further and the mist lifted to reveal a meadow mauve with autumn crocus; and everywhere the grey green willows of Corot, the bending rod of the August fishermen piercing their foliage...... Time to stand and stare, time to converse, time to be polite. Complete peace. And flowers everywhere: the banks purple with loostrife, mallow and willow herb. Old stone walls, ancient mellowed tiles, windows aflame with potted geraniums. We seemed to be the only things moving." I completely endorse Jim's views of this book. It is a period piece which has stood the test of time and is a "must read" for all waterways enthusiasts - even if your cruising horizons are limited to the British waters. It's been a big day in the Ahab household. Belle, after seven years of hard work, has graduated with a First Class Honours Degree in Literature from the Open University. I am so proud of the way she has stuck at this task during some very difficult years, and to end up with a First - Congratulations! Today was the official graduation ceremony at Symphony Hall, Birmingham - which was the scene of my own graduation twelve years ago. A new frock was purchased and a gown ordered and she looked stunning (as well as very clever). The ceremony was followed by a family celebratory meal at The Living Room on Broad Street. So what connection can all this have with the waterways? 3. The meal was in a room overlooking Gas Street Basin (design - not chance). Congratulations Belle, I am so proud of you. Here's to the Masters you start on the Autumn. I like most things about boating, but chilling out with a beer at the end of a long hot summer's day is right up there at the top of my list. However, this enthusiasm for balmy evenings on the water is somewhat undermined by the need to share the experience with all manner of flying bugs. Some buzz loudly, others whine on your ears as you try to sleep, but worst of all are the nasty little biters. Fortunately, they tend to prefer Belle, but her reaction when she wakes covered in bites is something else altogether! The end result, stained mahogany. Belle has taken exception to these airborne invaders and rather than consume half my salary on aerosol products with names like Doom and Raid, and further denude what little remains of the ozone layer, I have decided to invest in some flyscreens for Wand'ring Bark. Of course, to merely buy some flyscreens would be too easy, so a DIY approach was called for. This has resulted in screens for both the front and back doors, at a price I can afford. I was pondering what sort of netting or gauze I could use when I remembered the power of the Web. One quick search on Google using the ford "flyscreen" quickly led me to "The Flyscreen Company". Its name suggested that I was on the right track and I promptly ordered the minimum amount of polyurethane coated glass fibre mesh. 5m x 1.2m for £24 plus P&P which duly arrived a couple of days later. So, 30m of batten, a box of screws, two metres of flyscreen, a couple of metres of piano hinge, some mahogany wood stain and some varnish and you have it. The ultimate flyscreen for a narrowboat. Total cost of materials used? - about £35. No bugs, no bites and most importantly, no more bitten Belle in the morning. Regular readers may have noticed that my postings have become less frequent of late. This is partly because I have had to knuckle down and earn an honest crust away from the cut, and partly because I have been diverted by an interest in the aqueducts around the inland waterways. 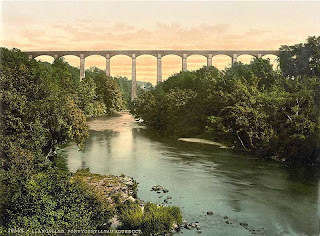 I have been struck by the number of aqueducts we pass over, crossing rivers, railways, roads and sometimes other canals. We are all familiar with the much photographed canal over canal aqueducts (Red Bull Junction, Hazlehurst Junction, Engine Arm on the BCN etc), but few of us have any idea what the other structures look like from below. I have therefore made a pledge with myself to make a point of stopping at the aqueducts I come across on my travels, and try to get a good side on photo, plus a bit of history where it exists. The end result is a sister blog - ukaqueducts - which documents my research using a mixture of my own photos and where necessary, other images sourced from the web. I will be adding aqueducts as I come across them and, over time, accumulate a comprehensive record. However, there are hundreds of them out there so this is destined to be a work in progress for many years to come. You may ask why, and my answer is why not? Curiosity is a good thing and it beats watching re runs of Top Gear on Dave! When does a culvert become an aqueduct? I really need to work out this distinction soon or I will end up with an ever expanding collection of small bore drainpipes! It's been a week for motor cars in the Ahab household. During last weekend's fishing trip I discovered that one member had a Peugeot 406 for sale, and I mentioned that it might be a suitable vehicle to replace Belle's ageing Peugeot 306. So we went round to see it on Monday evening and it soon became clear that it was too big for her needs. But this action put the idea of replacing her X reg car firmly centre stage in my mind, and the following day I spent some time on Auto Trader looking at what is what in the market, and what we could get for our money. That evening discussions went further and it was decided that what Belle really wanted was something similar to the current car, just newer, more reliable and more fuel efficient (diesel). I therefore returned to Auto Trader on Wednesday with an improved focus, and then went out of the office to buy some lunch. As I walked along the street I literally bumped into a parked Peugeot 307 HDI with a for sale sign in the back. It was uncanny, it was the exact car I had been looking for - right model, right engine, right age, right mileage and crucially, the right price. The owner soon showed up and gave me an inspection there and then. To cut a long story short, we came, we saw, we purchased. So that left Belle's old car sitting forlornly on the drive. I gave it a good wash and brush up and posted an advert on Auto Trader on Friday evening. Five photos for a two week run, all for £9.99! The process was simplicity itself - a bit like e-bay, and I cant speak highly enough of their service. Well, today (Saturday) I was out on the boat enjoying the summer sun. Well, enjoying it between endless phone calls about the car. My poor Blackberry was rung out of its holster and all I could do was tell people that I would be home after 6.00 pm. We returned at 5.50pm and Belle drove off (in her new pride and joy) to pick up Jeff and within 15 mins two callers told me that they were on their way for an immediate viewing. Imagine the scene: Belle and Jeff return to find a melee of five individuals on the driveway. Two parties have shown up at exactly the same time! I had to do a combined tour, and then act as chauffeur to the two key individuals - taking the car round the block to demonstrate its mechanical poetry in motion. Then came the funny part. Both guys were interested in making a purchase. They had both planned to try and haggle me down but found themselves in a weak position. They then both offered the full asking price! What were we to do? We considered the fact that one car had pulled up first (but the other was turning round in front of the house at the time). No solution in first come first served. We considered a dutch auction, but I didn't really want to play that sort of game. We finally settled on the toss of a coin to see which offer should be accepted. I had to borrow a coin from one of the prospective purchasers and allowed the lad for whom the car was potentially being bought to call - heads. I tossed, it landed, I revealed the face and.... heads it was! The lad got the car. The losing party had the good grace to have a laugh about the absurdity of the situation and we all agreed that in all the years we had all been buying and selling cars , none of us had ever come across a situation quite like this. So, the Peugeot 306 is dead, long live the 307. Three cheers for Auto Trader and three cheers for the cash in my wallet. Belle meets up with a group of friends from church once a week, and one of them has a significant birthday coming up and wanted the group to do something together to mark the occasion. After much discussion it was felt that a boat trip would be a good idea - would I be willing to assist? Is the Pope Catholic! Turn down an opportunity to spend the day with five lovely ladies pottering down a canal I love - I think not. This was the best offer I have had since my erstwhile headmaster messed up my school timetable and sadly informed me that I would have to attend my history lessons in the company of the typing class. Thirty hormonal, boy mad girls and me - heaven! In contrast to the storms of last weekend, the day was clear and dry as we made out way lazily down to Penkridge and back. The sun shone and the water sparkled almost as much as the champagne and strawberries. For all its age, things don't stay the same on the canal. Things change from month to month and BW's bridge signing programme has clearly passed this way. I noticed a rather nice new sign (two actually) on the Littleton Colliery Railway Bridge, and also extensive repair work underway on Lynehill Bridge. I also spotted another small aqueduct in the area, but a photograph will have to wait till the vegetation dies down in the autumn. On the way back we followed a slow but very friendly Anderson hire boat, making a relaxing two week circuit of the Four Counties Ring. I was puzzled by the extreme slowness entering Rodbaston Lock, only to discover that a member of the crew of the exiting boat had slipped and fallen in the cut, necessitating an urgent rescue. Luckily the damage was limited to bruised skin and bruised ego. Finally, I was delighted to find a cleared inlet immediately below Boggs Lock, three down from Gailey. I tentatively pushed WB's nose into the inlet and found that there was sufficient depth to wind. This means that we now has a short three hour round trip option, which includes passage through six locks. 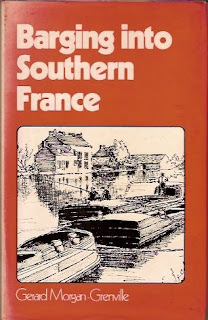 Following NB Starcross's recent review of Gerard Morgan-Grenville's first book, Barging into France I came upon a copy of the second in the series, Barging into Southern France, which I purchased for slightly less than the 1972 cover price of £2.95. Of course, I should have read the first book first, but from the off I found this second book a real page turner in its own right. It follows his journey in an ancient estuary barge "Virginia Anne" south from Epinal in mid France to Castetes near the Atlantic coast. This journey covered the Canal Marne a Saone, Canal bu Burgogne, River Saone, River Rhine, Canal Rhone a Sete and finally the Canal du Midi over three cruising seasons. Its very much a book about the place rather than about the people he met along the way, providing a detailed account of what was seen and done causing me to make repeated references back to the maps provided at the start of the book. Morgan-Grenville's jourmey appears to have been inspired by an earlier journey down the Upper Saone, undertaken by Philip Hamerton in 1886 and who is extensively quoted and provides historical context to this trip, which he saw as possibly one of the last journeys along some the the lesser waterways. Morgan-Grenville was a man of many talents and added thirty beautiful pen and ink drawings, which add significantly to the images his words create. This book caused me to reflect on the last 100 pages of Narrow Dog to Carcassonne, which covers much of the same ground. My frustration with Terry Darlington's comtemporary account was that there was a cracking tale trying to get out, but which never quite made it above the style of his prose. Morgan-Grenville descriptive style filled in many of the blanks and the two books, published thirty years apart, make in interesting combination. The sentiment they unequivocally share is that the Rhone is one scary river, and not one to be taken lightly. I was right there with GM-C on Virginia Anne, struggling to make a passage back up a few miles of the Rhone from Arles, to enter the Rhone a Sete, with the river's flow nearly overwhelming the capabilities of the underpowered craft. I am now in that tantalising position of not knowing quite how the author came to be in the middle of France on this old boat, or what happened next. All will be revealed when I get my hands on barging into France and then the third of the trilogy, Barging into Bergundy. As for Gerard Morgan-Grenville? Sadly he died this March (2009) at the age of 77. As well as promoting unusual travel destinations, he was also an ardent environmentalist, founding the world renown Centre for Alternative Technology in Wales. It was strange, reading his written words which sounded so similar to those spoken my my father in connection with his passion for our waterways. I know my father read these european books so I guess I owe a debt of gratitude to Mr Morgan-Grenville. A big posthumous thanks - gone but not forgotten. A weekend is never complete without a watery fix. This weekend it was the lads annual sea fishing trip involving the core of the "boat boys" staying in an assortment of houses and flats owned by three of the eight participants. Time pressures prevented coarse fishing on the Friday, but a full compliment rolled up on Friday evening ready for a most excellent curry cooked by Mr Truth, and full day on the Irish Channel on the Saturday. Things didn't look hopeful when a force 7 gale blew up overnight and the forecasts suggested more of the same on Saturday afternoon, accompanied by torrential rain which may, or may not, reach the coast. A large spider crab which became tangled in a line! We hoped for larger specimens (Tope) so moved three miles offshore to the edge of the shipping channel, but all we found were more dogfish with their abrasive skin and sharp teeth. With storm raging over nearby Snowdon and Cader Idris we decided to make for home at 3.00pm, and were promptly soaked by a mixture of rain and spray from the bows. What a contrast, the previous weekend it had been stifling hot with tee shirts and shorts, and now we were all wrapped up in fleeces and waterproofs, trying to stop our beer mugs from the Brittania Inn slipping through numbed fingers. A typical British summer!. Notwithstanding the deteriorating weather, it was a joy to be out on the salty stuff appreciating yet another watery perspective on life. Oh, and my tally : over 20, but with a specialism in the wicked Weaver Fish.